The way my mom makes "Nalagripudi" distinguishes it from the Sambhar powder of many homes. This is a versatile multipurpose powder. One could use this powder to makeIyengar style Nalagri which is like thicker form of rasam, eaten with rice. This powder could also be mixed with Yennegai, a side dish eaten with rice or chapati. It could also be mixed into vegetable "bath" rendering it a nice classy touch when compared to the regular "Chitranna". Here I will post the recipe for making 400 gms of Nalagripudi, enough to last for some months. Wash curry leaves and dry thoroughly in the sun. It should not have any moisture in it. Place a heavy bottomed vessel on the stove with the flame low. Do all the roasting in this vessel. Roast curry leaves, cinnamon sticks, asafoetida and gasgase together. Take care not to burn it. Keep aside in a container to cool. Roast kadlebele till light brown. Pour it into the same container to cool. Roast uddinbele till light brown. Pour it into the same container to cool. Roast dhania till light brown. Pour it into the same to cool. Roast the dry coconut till light brown. Take care not to burn it. Pour it into the same container to cool. Once all the ingredients are cooled, dry grind all of them to a fine powder. Spread out the powder into a large plate and allow to cool. Keep the Nalagri powder in an air tight container at all times. I had posted a recipe for making Nalagri. This recipe was about making instantaneous Nalagri powder. The variation to this recipe inorder to use this powder would be to just do the same as one would do for Rasam plus add 2-4 tsps of Nalagri powder. I will post a recipe for Yenagai soon and update this post on how to use this powder for that. 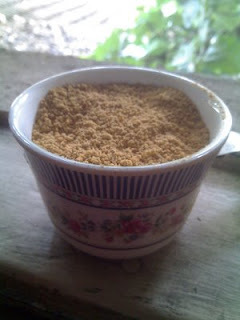 I will also post a recipe for Vegetable "bath" and update this post on how to use this powder for that.